After a bit of confusion this week, I finally understood what had happened to Barack Obama’s profile page on Pinterest. It seemed as if the account had pinned several “non-presidential” images to a board, but in reality a user had taken advantage of a security flaw in Pinterest. When you invite another user to collaborate on a board, that board becomes visible on that user’s profile too. So an inactive account like Obama’s could be “hijacked” to include any board without the account owner even noticing it. After that first incident, the person who managed the board that appeared on Obama’s page, removed it. But now it has happened again. 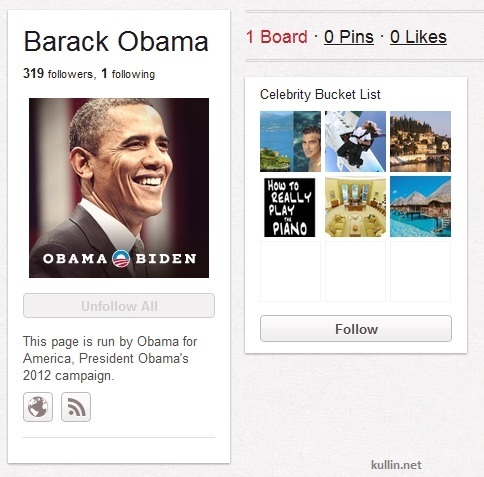 Another board is visible on pinterest.com/barackobama and once again it does not belong to that account. Having the President look like a fool on your site, can’t be good for business. Pinterest should change the procedure so that a user that has been invited to collaborate on a board actively has to agree that the board becomes visible on its profile.